Coming back to London was never going to be an entirely straightforward thing. There was baggage to carry and I don’t mean the Ryan Air hand luggage. I mean that there was history and time passed… There was just stuff. I left London eighteen years ago. I got in my car and drove to Wales, got on a ferry and came home to Ireland. I reckoned I’d be back again for a visit probably the year after and the year after that too. Eighteen years later and I had never been back. That might not mean so much if I had not lived so intensely for the fourteen years I had been there. Eight-three to ninety-seven. If my life today sometimes feels like it is a thing viewed through a small mobile phone, my life then was seventy millimetre wide screen and Dolby stereo. It was, in the way of these cities, the best of times and the worst of times. Each passing year that I didn’t go back made the going-back bigger. After a time, I didn’t want to return just as a goggle-eyed tourist, holding up all the people on the escalators. I wanted it to be for a reason. Somehow. I wanted it to count. There was no reason beyond that for not returning. I am a creature of habit and I fell into a routine which did not include revisiting where I had been before. I had loved London more than any place I had ever been. I had fed on it and learned it like the back of my hand. I just didn’t go back. Two weeks ago, I went back. My family and I flew over for a couple of days, specifically to let my boys see the Foo Fighters play Wembley Stadium. My previous post describes how that all worked out and you probably know anyway, if you follow the news. Never mind. London beckoned and we answered its call, regardless of who had broken their leg. So what was it like, Ken? After living there for all that time, then going away for so long and then coming back again… what was it all like? Truth? It was the same. It was just the same as it was before. Lovely London. I guess a few decades is not enough to wreak any truly significant changes on a juggernaut such as she. Of course there were some differences. The key initial impression was gained from things which had seemed shiny and new, just eighteen years before, and which now looked just a little bit tired. I noted two of those in particular. First there was Stanstead Airport where we flew into. Back in the nineties, it has seemed quite glowing and modern, with its all-encompassing space frame roof and its big open areas. Now the public parts seemed tired and worn. The same, too, could be said for the International (Channel Tunnel) Train Terminal at Waterloo. Back then, it had been all varnished-up and full of promise. Mission Impossible had featured it and Tom Cruise had made a phone call from in front of it. Last week, it looked weather bleached and moved-away-from, a pretty fair reflection perhaps. But it was the overriding ‘unchangedness’ of London that made the biggest impression and, really, how could you really expect anything much to change. The streets still intersect with each other as they always have done, the tube stations still align in the same inevitable order. It was a comfort, a rather exciting comfort to feel I could possibly still fit in to this gigantic, hyperactive town. Apart from the ageing of some installations, there was one other thing I thought was different. On Saturday, we had to be in town by 2.30 to see something. We went down to the river to ride a river bus in but the pier was closed so we got a bus to Sloane Square to hit the tube but the station was closed. So then we got a bus to Victoria. The bus could only go to the bus station because of the large demonstration in Central London. The guys were getting a bit twitchy, it was a walk to Victoria tube and time was fast ticking away. The District and Circle Lines were completely closed. We diverted up to Green Park and changed for Leicester Square and we got there. We shaved it tight but we got there fine. Sure, there were closures and cancellations and diversions but that’s not the difference I noted, that’s always been a thing. Here’s the difference. In Green Park, changing lines, we became part of the tightest most immovable throng of humanity I have ever seen. People had been diverted from everywhere, buses were not going through. We were stuffed into the tube corridors like so much toothpaste, shuffling forward in a subdued, head down, fashion. In truth, it was a bit scary. There seemed to be twice or three times as many people as there ever should have been and one couldn’t help but wonder, what if someone had to get out, what if someone fell over and got sick, what if… no, let’s not do that. When I came back to Ireland, my friend told me that it had always been that way, that I had simply forgotten the crowds of people under the ground. Maybe he’s right. Maybe I had lost the knack of the big city after all. I don’t think so, though. I think there was simply too many people in the tiled circular tunnels that Saturday and I didn’t like it all that much. All in all, London was the same old London I have loved for such a long time. 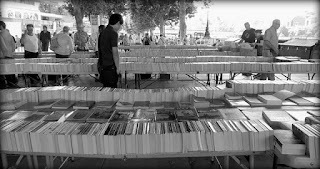 The book tables on the South Bank were still there and seemed to contain the same books, the Gap still has to be minded, and the people who pay to be entertained attend with a commitment and a focus which reflects the huge amount of money they have paid to be there. Most of all, from my visit, was a sense of being back at the centre. Deep in the hub. The sense that one was rubbing shoulders with people at the top of their game because this was the place for them to be. I’m proud that I once used to be one of them. I’m not any more but maybe now, having broken my duck, I may get to come back a little more often and pretend for a while that I could somehow belong again. If Heraclitus had been alive today he would’ve probably written, “You can’t step into the same London street twice.” Me? I’m s bridge burner. I went back to my secondary school a few months after leaving and pretty much swore I’d never do that again. There are a lot of places I’ve haven’t been for eighteen years. I do get nostalgic—far more so in recent years than I used to—but I regard it as a headache or a stomach upset, something to put up with until it goes away. I found a site a while back where some nice person had uploaded school photos from my time and I downloaded the lot. Every now and then I’ll look at them and miss the people but then I have to remind myself that these people don’t exist and haven’t existed for a long time. Now they’re grannies and granddads, those that aren’t dead. Remembering the past makes me very sad but it’s an odd kind of sadness because I’m not sure what I’m sad about. What I’m sad about is not being able to step back into that photo and for not making more of my time there although looking back my school days, especially the four years at the academy, were some of the best years of my life and I really shouldn’t have the regrets I have. I’ve never been to London so I’ve no idea what the streets are like. I’ve never harboured any deep desire to go either. One big city is very much like another. Especially these days now the chains have taken over. Is a London Costa going to be any different to a Glasgow Costa or just dearer for no good reason?